Airbus has planned one of its biggest-ever participations at Aero India, to be held in Bengaluru from 20 to 24 February 2019. The centrepiece of the flying displays will be the A330neo – the latest addition to the Airbus widebody family featuring advanced materials, new optimised wings, composite Sharklets and new engines that together deliver 25% reduced fuel burn and CO2 emissions. Demonstration flights will also be performed by the new-generation tactical airlifter C295 which can perform multi-role operations in all weather conditions. Visitors at the Airbus exhibit – Hall E 2.8 & 2.10 – will be able to learn more about the company’s continued commitment to supporting the growth of India’s aviation, defence and space sectors, particularly in the areas of ‘Make in India’ and ‘Startup India’. Aerospace fans will also be able to savour interactive virtual and augmented reality experiences at the Airbus stand. On display will be scale models of the C295, the A330 MRTT, the A400M and the SES-12 – a geostationary communications satellite and a holographic display of the Hybrid SAR Earth observation radar satellite. 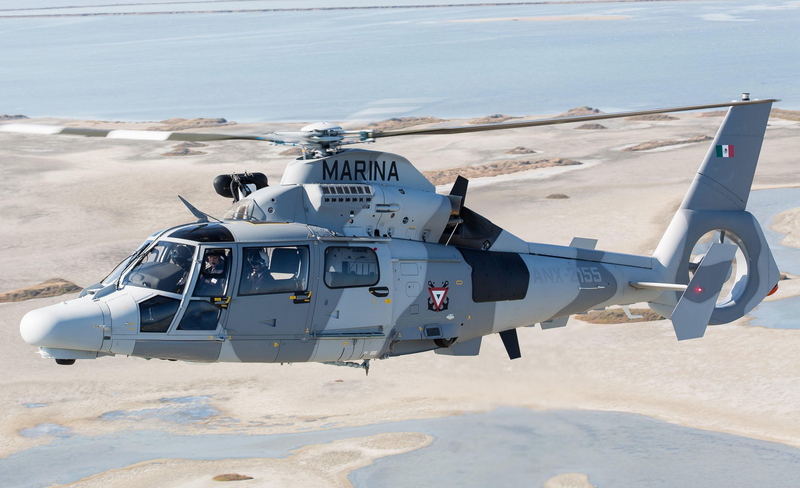 In helicopters, scale models of the H225M – the military version of Airbus’ H225 Super helicopter; the AS565 MBe (pictured) – the all-weather, multi-role force multiplier; along with the H135 and H145 twin-engine helicopters will be on display. Commercial aircraft scale models will include A330-900, the member of Airbus’ A330neo new-generation widebody, the A321neo and ATR 72-600. Airbus’ Advanced Inspection Drone, which accelerates and facilitates visual checks, considerably reducing aircraft downtime and increasing the quality of inspection reports, will also be showcased. In India, Airbus has sought to foster innovation and entrepreneurial spirit through Airbus BizLab, which will be present at Hall E 2.9. Visitors will get a first glance of the opportunities that the startup accelerator has created in the Indian innovation ecosystem. Airbus Bizlab will also partner with Invest India to organise the ‘Startup Day’ at Aero India. The company will also leverage the event to recruit staff. On 23 and 24 February, Airbus will offer members of the public the opportunity to explore career prospects with Airbus India in Avionics Software, Aircraft System Simulation and Airframe Structures as well as in API Development, Full Stack Development, Big Data, Cloud and DevOps. See latest HD Video Interviews, Podcasts and other news regarding: Airbus, India.